Synopsis: Ever feel like a T-rex when wrestling to change a flat? 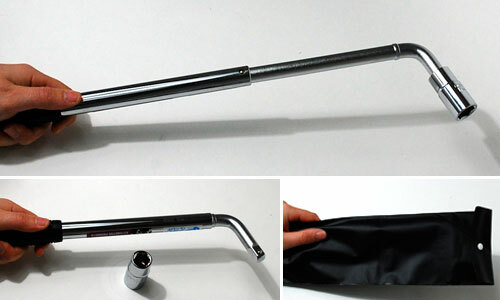 Keep one of these Telescoping Lug Wrenches in your boot in case you end up with a flat in the middle of nowhere....relying on the stock lug wrench (which is VERY hard to get any leverage with) is not a good idea. This wrench is pretty cool because the shaft extends to double the length to make it easier to crank on stubborn lugs. Comes with 4 sockets to fit nearly every wheel and a storage bag!